What was or is your favorite Dungeons and Dragons(any version) item? 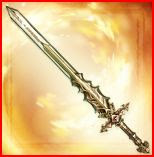 I always wanted but never got (in any way, shape or form) the +5 Holy Avenger(it's only +5 when it's pissed)! Ioun Stones. Not sure why I thought the idea of having a orbiting floating stone was so awesome. Staff of the Magi - Because retributive strikes were the ultimate F U. Bag of Holding - Most useful item evar! Ioun Stones were awesome, but my favorite was probably the deck of many things. I would love to have a gun that shoots Rot Grubs. My favorite was the Airship I gave the guys. It had paratrooper orks that repelled down and ambushed on command. Not a specific item, but hella-awesome. My favorite was this ridiculous bird someone gave me as a familiar that had razor bone wings. on a 17+ it cut off an arm. On a 20 it cut off a head. It was awesome when the party turned on me and I cut off the douchebag thiefs head with that thing. Good times!